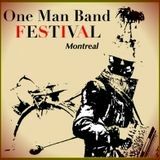 The One Wo/Man Band Festival (Le Festival de Musique Solitaire - NEXT EDITION IN MONTREAL CANADA 23th TO 26th MAY 2013!!) is a unique new music festival that celebrates and showcases the talents and creativity of one-man/woman band musicians and performers the likes of loop artists, singer songwriters, djs, and other forms of solo performance. For reasons of feasibility, creative expression, financial limitations and technological advancements in music production, artists today are finding new ways to express their output by recording, touring and performing alone! This festival aims to showcase their talents and support the one-man/woman band phenomenon!